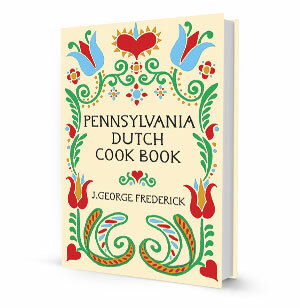 Written by J. George Frederick, this book is filled with detailed recipes and accurate descriptions of the food, life and times of the Pennsylvania Dutch. Enjoy signature dishes such as Pork Ribs and Sauerkraut, Dutch Barbeque Chicken, Scrapple Cabbage - Bethlehem, Hot Potato Salad, Fried Green Tomatoes, Dutch Bacon Peas, Dutch Apple-Lemon Custard Pie and many more! This fabulous book includes hundreds of authentic recipes and is a true pleasure with many historical references to all types of Dutch cuisine. If you desire to learn about Dutch Cookery, or if you enjoy the history of Dutch cooking, you'll enjoy a heaping helping of both with this fabulous cookbook. So dust off your Dutch oven. This is a deal of historic proportions!